In this work, a series of hybrid porous hypercrosslinked polyanilines were successfully synthesized by polyaniline and octavinylsilsesquioxane (OVS) via the Friedel–Crafts alkylation reaction. Compared with N-alkylation reaction, the new synthetic approach circumvents some intractable problems, such as high reaction temperatures and pressures, tedious procedures and limited reactants. 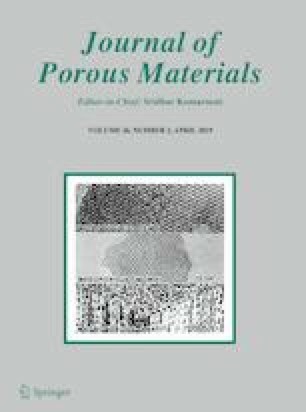 The resulting hybrid porous polyanilines had apparent surface areas in the range of 22 ± 5 to 461 ± 20 m2 g− 1, and total pore volumes in the range of 0.08–0.30 cm3 g− 1. The porosity of these polymers can be fine-tuned by varying the mass ratio of OVS to polyaniline. Gas sorption applications reveal that the CO2 adsorption capacity of HPANI-5 was 0.59 mmol g− 1 (2.60 wt%) at 298 K and 1.01 bar. Cr(VI) removal experiments reveal that HPANI-1 possessed the maximum Cr(VI) removal capacity at 308 K and pH 1 with an equilibrium adsorption capacity of 1230 ± 80 mg g− 1. The results suggested that the resulted hypercrosslinking polyanilines had potential to be used as adsorbents for CO2 uptake and Cr(VI) removal. The online version of this article ( https://doi.org/10.1007/s10934-019-00747-5) contains supplementary material, which is available to authorized users. This research was supported by Joint Funds of Shandong Provincial Natural Science Foundation and Colleges and Universities of Shandong Province (ZR2017LEM013), National Natural Science Foundation of China (Grant Nos. 51372124, 51572134, 51503108), Program for Scientific Research Innovation Team in Colleges and Universities of Shandong Province and Shandong Provincial Key Laboratory of Fluorine Chemistry and Chemical Materials.